As we left behind the lush, manicured, green suburbs of Sydney on our 1380km drive to Adelaide, we encountered golden scrubland punctuated by trees, grazed by cattle and sheep somnolent in the warm morning sunshine. The road was undulating at first with gullies, creeks and water holes but it gradually became flatter and, as we neared our overnight stop in Hay, dotted with small vineyards. 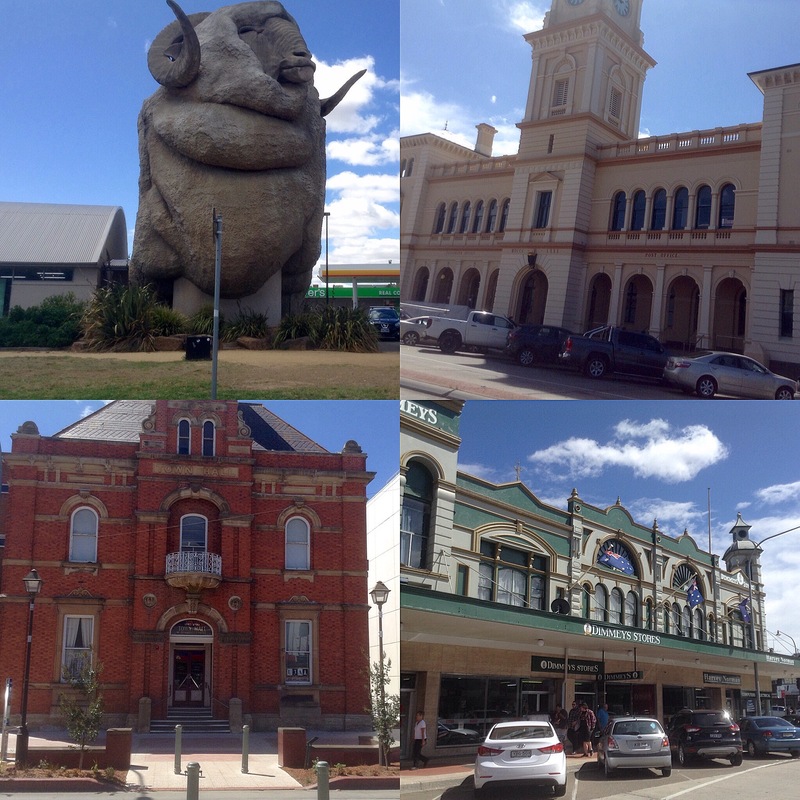 Goulburn was our first port of call. It was Australia’s earliest inland city and is famous for wool production, which explains the town’s giant statue of a ram. We dined at the Niagara Café, first opened in 1902 by a Greek called Nick and still run by his ancestors. The cafe had last been updated in the early 70s and was clearly a popular luncheon spot. Photographs of Greece and its sporting triumphs covered the walls. 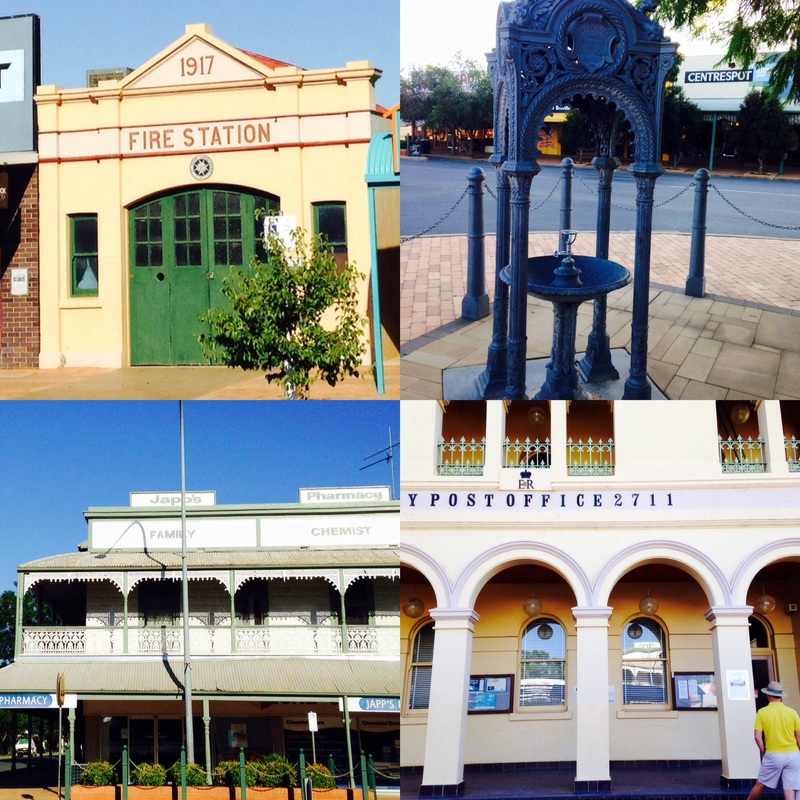 Some 250km later we filled up the tank in Wagga Wagga (many crows – another Hitchcock reference? ), the garden city of the south. I have insisted, we fill up with petrol at every opportunity. I didn’t want us to run out. We broke our journey overnight in a forgettable motel in Hay on the Murrumbidgee River, another of Australia’s premier wool growing areas. During WWII it was home to three prisoner of war camps. I suspect no one ever tried to escape. We dined in thanks to the local supermarket as all the cafes had closed late afternoon and neither of us fancied a takeaway. The following day, we were now on flat pastoral roads with endless blue sky, scrubby grass, knolls of trees, and plenty of cattle and sheep as far as the eye could see, and beyond, as the road snaked endlessly beyond the horizon. We stopped for a light lunch in Ouyen, a small town at the junction of the Calder and Mallee highways, roughly mid-way between Adelaide and Melbourne, at what appeared to be its one and only restaurant. As we drove closer to Adelaide, the countryside changed again, with more and more vineyards and orchards amidst the scrub, as we entered the fertile Murray River plane. We reluctantly gave up our organic tomatoes at the border control between S Australia and New South Wales. Just as well we’d eaten the peaches and apples the night before. This leg was a question of getting from A to B as quickly as possible but it nonetheless provided us with some spectacular countryside, an insight into what life was like in the Outback and what a challenge it must have been for the early settlers. The towns en route had charmed. You had a sense of going back in time, particularly when you looked at the cafe menus. They reminded us of small neighbourhood restaurants, providing excellent home cooked food just like my grand-mother used to make. We also pondered what did Aussie families do to entertain their kids on long journeys before technology helped them out? It would have been pretty useless to play either pub cricket or even I Spy. Still there’s always the Spelling Bee or Mental Arithmetic, two of my Dad’s favourites. We sang along to the selection of tracks on my beloved’s iPhone. Luckily the roads were deserted so no one could hear us. Neither of us can hold a tune.